This story was updated at 6:20 p.m. EDT. CAPE CANAVERAL, Fla. — Despite a grounded space shuttle that won't be launching today (April 29) after all, President Obama and his family visited NASA's Kennedy Space Center (KSC) here as planned. 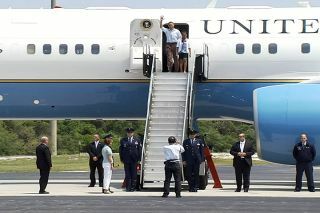 Obama, his wife, Michelle, and their daughters Malia and Sasha landed on Air Force One at Cape Canaveral Air Force Base shortly after 2 p.m. EDT (1800 GMT), and then took his helicopter, Marine Force One, over to the space center. "We obviously wished he could have seen a launch," said Kennedy Space Center Director Bob Cabana in a press conference Friday afternoon. "But he promised to support, and told us to look to a good future. Hopefully we can lure him back for another launch in the future." Endeavour was slated to launch at 3:47 p.m. EDT (1947 GMT), but NASA called off the attempt at 12:16 p.m. EDT (1647 GMT) when mission managers decided there was not enough time to fix a broken power unit on the shuttle. Obama's visit was to have been the second time a sitting president has viewed a launch in person. The last visit was from President Clinton in 1998 to watch the space shuttle Discovery lift off. Instead of a shuttle launch, the Obamas received a guided tour of a space shuttle hangar – called the Orbiter Processing Facility 1 – where the Atlantis orbiter is being prepared for its last mission. That flight – which will be the last mission for NASA's 30-year space shuttle program – is set to launch on June 28. "I understand the girls asked some great questions, and they were really enthused," Cabana said. The Obamas also visited the launch control complex, and met with Endeavour's crew. Obama last visited the Kennedy Space Center in April 2010, when he unveiled a new space vision for NASA that called for a mission to send astronauts to an asteroid by 2025, and then aim to send crews to Mars in the 2030s. Today, Obama may also meet with another high-profile visitor to the spaceport: Gabrielle Giffords, the Arizona congresswoman who was shot in January while meeting with constituents outside a Tucson grocery store. Giffords is here to watch her husband, Endeavour's commander Mark Kelly, launch into space. Kelly and his five Endeavour crew mates are currently awaiting word on when they will next try to launch their 14-day mission to the International Space Station. Endeavour is carrying a $2 billion astrophysics experiment and some spare parts for the space station. Four spacewalks are planned for the mission. After this flight, Endeavour will be retired to the California Science Center in Los Angeles, where it will be put on public display. NASA's other spaceworthy shuttles, and the Enterprise prototype (which never flew in space), will also be retired to museums.